The size of a full grown adult pomsky depends on the type of pomsky cross breed. An adult pomsky is usually between 10 to 15 inches tall, from the floor to the shoulder (where the neck meets the spine). 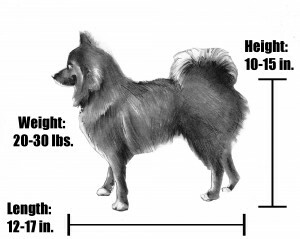 It’s impossible to know the exact height of a pomsky because the height depends on the height of the parents; assuming that the average height of a female Siberian husky is between 20 to 22 inches and the average height of a male Pomeranian is between 8 to 11 inches, we usually see full grown pomskies grow to be 10 to 15 inches tall. A full grown pomsky is slightly longer than its height. The average length of a pomsky is between 12 to 17 inches from chest to rear. A full grown pomsky usually ranges between 20 to 30 pounds. Once again, this depends on the parents of the pomsky; assuming the average weight of a female Siberian husky is between 35 to 50 pounds and the average weight of a male Pomeranian is between 3 to 7 pounds, we usually see full grown pomskies grow between 20 to 30 pounds. We cannot guarantee that your pomsky will be 15 inches and 20 pounds; like we mentioned this fully depends on the parents and the type of cross breed. There is always a chance that your pomsky could grow to be above or below the average. If your pomsky is 50 pounds and 25 inches tall, you’ve likely fallen for a pomsky scam. On the contrary, beware of breeders that claim to breed pomskies smaller than 10 to 15 inches. Breeders should not be intentionally breeding smaller pomskies. This is a shady unethical practice that sacrifices the heath of the parents to produce a smaller pomsky and only ends up breeding an unhealthy puppy. The size of a pomsky is a natural phenomenon; it is not the breeder’s decision to create a smaller pomsky. Thanks for sharing your thoughts on full grown pomsky.